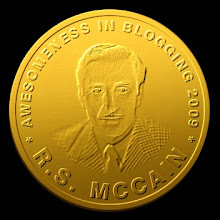 Merry Christmas to you Robert, however belated, and keep up the great work...your blog is awesome! I never for a moment thought that Obama attended church for any purpose other than building a political base. And obviously, that work is now done. "Obama won't get this kind of coverage forever." I'm afraid that he will. To be the first to criticize him would require courage and integrity. How many journalists nowadays have that? It's possible we might see him criticized for not being left-wing enough. But even that will be gentle reproach, not real criticism. 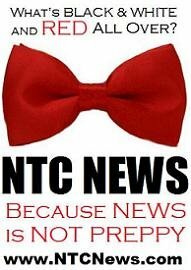 The media has given up on all the characteristics it used to proclaim as virtues: independence, courage, integrity, non-partisanship, honesty, etc. It's going to be a long 4 (maybe 8 years). I just love the idea of skipping out on doing stuff I don't particularly care to do by claiming I'm "keeping a low profile." That baby's going to get a real workout from me this coming year. Dept Head: "Have you got that committee report ready yet?" Me: "No. I didn't go to the all-day meeting of the University Committee on Diversifying the Diversity Committee because I'm keeping a low profile." BHO's breasts appear to be rather large and fleshy for a man of his build. The Bay City Rollers pin up isn't gay. It's Seventies! Man we dressed embarrassingly that decade. Well, Other McCain, I don't think that the coverage of Obama will vary. Because of what the media has become, It IS Tiger Beat, serving a mostly female (and single) audience wanting an "idol" (though not a teen one) to worship as the perfect imaginary boyfriend. Obama won single women 70-29. Single women dominate the culture, and form the main consumers of media, including TV, newspapers, and magazines. This is the new demographic reality, and demography is destiny. So I don't see that happening, ever. What *IS* likely is that someone will, like Drudge with Monica Lewinsky, get a "dump" of some killed investigation of an Obama scandal. Coming from Chicago I'm sure there are plenty of personal and political and financial scandals lurking around. Huge traffic boosts and the cheapness of this model will allow entrepreneurs to compete with the media, and it's interesting that sites like Drudge skew far more male than the media (which is basically mostly women audience/readers). That's a huge market gap and someone will take advantage sooner or later. But it will not be the media. 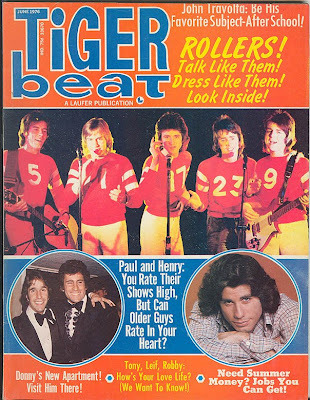 They are all Tiger Beat, and the Bay City Rollers never had girls turn on them. It was guys who hated them. Given the title of this post, I got confused, "Bay Area Rollers" with "Bay Area Bombers"! As a 60's Roller Derby fan I'd thought the link was a positive one, rather than an accurate one. "Obama wo'nt get this kind of coverage forever"
No, just for the next eight years. Here's is Yungi, author of the Time piece. It would appear that she has a taste for the dark meat. I'm with the folks who think the sycophantic coverage will last forever or, at the least, for the duration of the Obama presidency. Indeed, it may get even more sycophantic if things go really, really sour (economic collapse, successful major terrorism, etc). You see, they won't be protecting Obama and his image: they'll be protecting their own psychological investment in his election. To say that media coverage of BHO should, at some point, move back towards a semblance of balance or fairness or at least basic standards of inquisitiveness is to misapply market principles to truth. The media will triangulate on (i.e., revert to) the mean of its market -- a market that has lost its taste for truth, (and perhaps even its ability to recognize or credit it).